Introducing the Gc CONNECT 'Touch' smartwatch powered by Androidwear 2.0. Embracing all the Gc signature codes of remarkable design and infinite attention to detail, the versatile and contemporary Gc CONNECT can be customised to adapt to all occasions with its customisable watch face, sub dials and interchangeable straps. For a truly Smart Luxury experience, simply pair with your iOS or Android smartphone to receive notifications and respond to texts, emails and more. 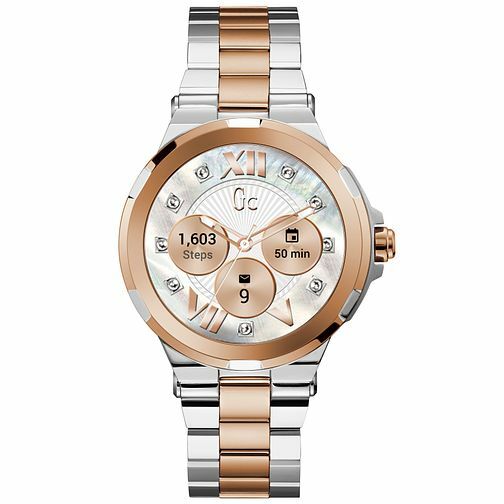 Download apps directly onto your Gc CONNECT from the on-watch Google Play store, co-ordinate your day using Voice Activation from Google Assistant and reach your goals with the fitness tracking features.This Gc CONNECT unisex smartwatch features a 44mm brushed and polished Rose Gold PVD case with black PVD bezel, black ceramic bracelet and black digital dial.